Sigismund of Luxembourg (1368–1437), king of Hungary, Roman German king and finally emperor of the Holy Roman Empire, is not only a prominent figure of the late Middle Ages in “Catholic” Western Europe; always close were also his contacts with the “Orthodox World” in Eastern and Southeastern Europe. These contacts did not only include his crusade against the Ottomans, which failed at Nicopolis in 1396, but continued until the end of his reign. Particularly intensive were of course his relations with the two Orthodox Danubian principalities of Moldavia and Wallachia, and with the Orthodox Christians living within the Kingdom of Hungary in Transylvania in large numbers. 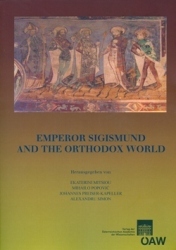 The studies combined in this volume try to illuminate this aspect of the activity of Sigismund, his diplomatic, military and church-political efforts to achieve unity, both between Eastern and Western Church and within the Western Church, and to organise the defense against the Ottoman expansion. Some contributions also show that Sigismund’s efforts arose the attention of his Byzantine contemporaries who mention him in various sources. Because of this interdisciplinary view from east to west and vice versa, the volume is of interest both for medieval studies directed at Western Europe as well as at Eastern Europe.